Hurricane Sandy was an Atlantic tropical cyclone which affected parts of the Caribbean, Mid-Atlantic and Northeastern United States in late October 2012, and became the largest Atlantic hurricane in diameter, with winds spanning 1,100 miles (1,800 km). It made landfall on the East Coast of the United States and Eastern Canada (Nova Scotia). Sandy is the eighteenth tropical cyclone, eighteenth named storm, and tenth hurricane of the 2012 Atlantic hurricane season. The storm developed from a tropical wave in the western Caribbean Sea on October 22. It quickly got bigger and stronger after becoming a tropical depression. It was then upgraded to a tropical storm six hours later. Sandy moved slowly northward toward the Greater Antilles and got stronger. On October 24, Sandy made landfall in Jamaica and was upgraded to a hurricane. 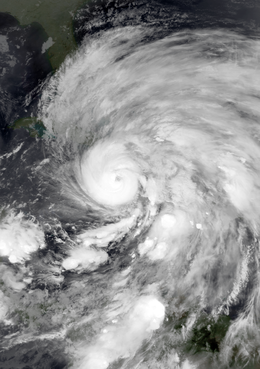 Sandy made a second landfall in Cuba, where it became a Category 3 hurricane. At least 43 people were killed: 40 in the Caribbean and three in the Bahamas. On October 25, Sandy got weaker and became a Category 1 hurricane. On October 27, Sandy became a tropical storm for a few hours. It then became a Category 1 hurricane again that morning. On October 26, Washington, D.C. Mayor Vincent Gray declared a state of emergency for the nation's capital. That same day the governors of Connecticut, Maryland, Massachusetts, New York, Pennsylvania and Virginia also declared a state of emergency. Landfall in New Jersey came on October 29. Damage was extensive there and in New York. It was the 2nd costliest hurricane behind Hurricane Katrina (2005). On October 19, a tropical wave was moving westward through the eastern Caribbean Sea. It had an extended low pressure area. It was expected to become better organized. On October 20, the system became better organized as expected. The National Hurricane Center (NHC) reported that it had a high potential for it to become a tropical cyclone within 48 hours. The next day, thunderstorms were small. Although, barometric pressure in the area remained low. Because of this, the system had potential for development. The thunderstorms got bigger, while the system slowed and eventually stopped moving. At 1500 UTC on October 22, the NHC gave out advisories on Tropical Depression Eighteen. The NHC reported that the storm was 320 mi (515 km) south of Kingston, Jamaica. When the tropical depression formed, it was in an area of weak steering currents. This was located south of a ridge extending eastward from the Gulf of Mexico. The system was in an area favorable for strengthening. Late on October 22, a Hurricane Hunters flight found winds of 40 mph (64 km/h) in a rainband. This made NHC to upgrade the depression to Tropical Storm Sandy. Because of the moist atmosphere, the storm got better organized. Early on October 24, an eye began to develop. By that time, Sandy was moving slowly northward. At 11:00 am EDT (1500 UTC) on October 24, the NHC upgraded Sandy to hurricane status. This was because the Hurricane Hunters found winds of 99 mph (159 km/h). At the time, Sandy was located about 65 miles (105 km) south of Kingston, Jamaica. Sandy made landfall near Kingston at 3:00 p.m EDT (1900 UTC) on October 24. It had winds of about 80 mph (130 km/h). Before making its second landfall, Sandy got stronger and became a Category 2 hurricane on the Saffir-Simpson scale with 110 mph (175 km/h). At 1:25 am EDT (0525 UTC), Sandy made landfall in Cuba just west of Santiago de Cuba. When it made landfall in Cuba, Sandy had a visible eye of over 23 miles (37 km) in diameter. At the time, winds reached 135 mph (216 km/h). While over land, the storm weakened and the eye was no longer visible. After Sandy left Cuba, dry air and increasing shear caused the storm to be disorganized. A mid-level low over Florida turned the hurricane toward the north-northwest. By early on October 26, most of the storm was to the north of the center. This caused the storm to get larger. By the next day, the NHC reported that Sandy was starting to become more of a hybrid cyclone. 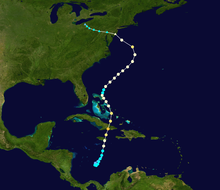 On October 27, Sandy weakened to a tropical storm. A few hours later, it got stronger and became a Category 1 hurricane again. After Sandy developed into a tropical cyclone on October 22, the Government of Jamaica issued a tropical storm watch. Early on October 23, the watch became a tropical storm warning. That same day, a hurricane watch was issued for Jamaica. On that same day at 1500 UTC, the hurricane watch was upgraded to a hurricane warning. The Government of Haiti issued a tropical storm watch for Haiti. By late October 23, it was upgraded to a tropical storm warning. There was a hurricane watch issued for the Cuban Provinces of Camagüey, Granma, Guantánamo, Holguín, Las Tunas, and Santiago de Cuba at 1500 UTC on October 23. Only three hours later, the hurricane watch was switched to a hurricane warning. Only three hours later, the hurricane watch was switched to a hurricane warning. The Government of the Bahamas issued a tropical storm watch for the Acklins, Cat Island, Crooked Island, Exuma, Inagua, Long Cay, Long Island, Mayaguana, Ragged Island, Rum Cay, and San Salvador Island. Later that day, another tropical storm watch was issued for Abaco Islands, Andros Island, the Berry Islands, Bimini, Eleuthera, Grand Bahama, and New Providence. By early on October 24, the tropical storm watch for Cat Island, Exuma, Long Island, Rum Cay, and San Salvador was upgraded to a tropical storm warning. At 11:15 a.m. EDT (1515 UTC) on October 26, the Bermuda Weather Service issued a tropical storm watch for Bermuda. This was because of the size of the storm and its possible effect on the island. Many public schools on the Treasure Coast and in Palm Beach County, Florida were closed for Friday October 26. FEMA announced that they will monitor Sandy and help those in need. Government weather forecasters said there is a 90% chance that the East Coast of the United States get "slammed". Utilities and governments along the East Coast prepared for long-term power failures. In New Jersey, where the storm was expected to come ashore, utilities told employees to be prepared for longer shifts. On October 26, North Carolina Governor Beverly Perdue declared a state of emergency for 38 counties. The emergency took effect on October 27. GOP presidential candidate Mitt Romney cancelled a campaign in Virginia Beach because of Sandy. Joe Biden also cancelled his campaign because of Sandy. The US Navy sent more than two dozen ships to sea from Norfolk Naval Base, for their protection. On October 26, Washington, D.C. Mayor Vincent Gray declared a state of emergency for the nation's capital. That same day the governors of Pennsylvania, Maryland and Virginia also declared a state of emergency. Philadelphia's Mayor Michael Nutter asked residents in low lying areas to leave their home by 2 p.m October 28. In New York City, officials activated the city's coastal emergency plan. The subways closed. There were also evacuations for residents in areas where Hurricane Irene made landfall in August 2011. Mayor Michael Bloomberg said that some residents should prepare to evacuate. New York Governor Andrew Cuomo declared a state of emergency for every county in the state. On Long Island, Suffolk County officials ordered a mandatory evacuation of Fire Island residents. Cuomo went on to declared that Hurricane Sandy had been “more impactful” than Hurricane Katrina. Connecticut's Governor Dan Malloy opened the state's Emergency Operations Center on October 26. Malloy signed a Declaration of Emergency the next day. Massachusetts Governor Deval Patrick declared a state of emergency. The Canadian Hurricane Centre issued its first statement of Sandy on October 25, 2012. One model suggested that Sandy would make a landfall in the East Coast of the United States, possibly affecting Southern Ontario. At least 253 people were confirmed killed across the United States, the Caribbean, Canada, and the Bahamas, as a result of the storm. The New York City Subway was shut down for days, and parts of it for months. Large areas lost electric power distribution for days. Thousands of houses were damaged by wind and flood, and hundreds burned because firefighters could not reach them. ↑ "Sandy Brings Hurricane-Force Gusts After New Jersey Landfall". Washington Post. Retrieved 30 October 2012. ↑ "Sandy Becomes Largest Atlantic Storm on Path to Northeast". San Francisco Chronicle. Retrieved 30 October 2012. ↑ Todd Kimberlain (2012-10-19). Tropical Weather Outlook (TXT) (Report). National Hurricane Center. Retrieved 2012-10-23. ↑ Stacy Stewart (2012-10-19). Tropical Weather Outlook (TXT) (Report). National Hurricane Center. Retrieved 2012-10-23. ↑ Eric Blake (2012-10-20). Tropical Weather Outlook (TXT) (Report). National Hurricane Center. Retrieved 2012-10-23. ↑ Jack Beven (2012-10-21). Tropical Weather Outlook (TXT) (Report). National Hurricane Center. Retrieved 2012-10-23. ↑ Robbie Berg (2012-10-21). Tropical Weather Outlook (TXT) (Report). National Hurricane Center. Retrieved 2012-10-23. ↑ Stacy Stewart (2012-10-22). Tropical Weather Outlook (TXT) (Report). National Hurricane Center. Retrieved 2012-10-23. ↑ 9.0 9.1 Robbie Berg; Lixion Avila (2012-10-22). Tropical Depression Eighteen Discussion Number 1 (Report). NHC. Retrieved 2012-10-23. ↑ Richard Pasch (2012-10-22). Tropical Storm Sandy Discussion Number 2 (Report). NHC. Retrieved 2012-10-23. ↑ Stacy Stewart (2012-10-23). Tropical Storm Sandy Discussion Number 3 (Report). National Hurricane Center. Retrieved 2012-10-23. ↑ Jack Beven (2012-10-24). Tropical Storm Sandy Discussion Number 7 (Report). National Hurricane Center. Retrieved 2012-10-24. ↑ Michael Brennan (2012-10-24). Hurricane Sandy Discussion Number 9 (Report). National Hurricane Center. Retrieved 2012-10-24. ↑ Todd Kimberlain; James Franklin (2002-10-24). Hurricane Sandy Tropical Cyclone Update (Report). National Hurricane Center. Retrieved 2012-10-24. ↑ Stacy Stewart; Dave Roberts (October 25, 2012). Hurricane Sandy Tropical Cyclone Update (Report). National Hurricane Center. Retrieved October 26, 2012. ↑ Stacy Stewart (2012-10-25). Hurricane Sandy Discussion Number 12 (Report). NHC. Retrieved 2012-10-26. ↑ Michael Brennan (2012-10-25). Hurricane Sandy Discussion Number 13 (Report). NHC. Retrieved 2012-10-26. ↑ Michael Brennan (2012-10-25). Hurricane Sandy Discussion Number 14 (Report). National Hurricane Center. Retrieved 2012-10-26. ↑ Jack Beven (2012-10-26). Hurricane Sandy Discussion Number 15 (Report). National Hurricane Center. Retrieved 2012-10-26. ↑ Michael Brennan (2012-10-26). Hurricane Sandy Discussion Number 16 (Report). National Hurricane Center. Retrieved 2012-10-26. ↑ Jack Beven (2012-10-27). Hurricane Sandy Discussion Number 19 (Report). National Hurricane Center. Retrieved 2012-10-27. ↑ Jack Beven (2012-10-27). Tropical Storm Sandy Discussion Number 20 (Report). National Hurricane Center. Retrieved 2012-10-27. ↑ Daniel Brown (2012-10-27). Hurricane Sandy Discussion Number 21 (Report). National Hurricane Center. Retrieved 2012-10-27. ↑ Robbie Berg; Lixion Avila (2012-10-22). Tropical Depression Eighteen Advisory Number 1 (Report). National Hurricane Center. Retrieved 2012-10-24. ↑ Daniel Brown (2012-10-23). Tropical Storm Sandy Advisory Number 4 (Report). National Hurricane Center. Retrieved 2012-10-24. ↑ 26.0 26.1 26.2 Richard Pasch (2012-10-23). Tropical Storm Sandy Advisory Number 5 (Report). National Hurricane Center. Retrieved 2012-10-24. ↑ Richard Pasch (2012-10-22). Tropical Storm Sandy Advisory Number 2 (Report). National Hurricane Center. Retrieved 2012-10-24. ↑ Richard Pasch (2012-10-23). Tropical Storm Sandy Advisory Number 5A (Report). National Hurricane Center. Retrieved 2012-10-24. ↑ 29.0 29.1 29.2 Richard Pasch (2012-10-23). Tropical Storm Sandy Advisory Number 6 (Report). National Hurricane Center. Retrieved 2012-10-24. ↑ John Beven II (2012-10-24). Tropical Storm Sandy Advisory Number 7 (Report). National Hurricane Center. Retrieved 2012-10-24. ↑ Richard Pasch (2012-10-26). Hurricane Sandy Tropical Cyclone Update (Report). National Hurricane Center. Retrieved 2012-10-26. ↑ "UPDATED: Hurricane Sandy closings and cancellations". cbs12.com. Retrieved 25 October 2012. ↑ "Closely Monitoring Hurricane Sandy". FEMA. Retrieved 26 October 2012. ↑ BORENSTEIN, SETH. "EAST COAST READIES FOR 'FRANKENSTORM' MONSTER". Associated Press. Retrieved 26 October 2012. ↑ "Eastern utilities brace for expected super storm". The Washington Examiner. Retrieved 26 October 2012. ↑ "Perdue declares state of emergency before Sandy arrives". WRAL.com. Retrieved 26 October 2012. ↑ 37.0 37.1 "Northeast in crosshairs of 'superstorm' Sandy". CNN.com. Retrieved 26 October 2012. ↑ "DC mayor declares state of emergency in anticipation of Hurricane Sandy". The Washington Post. Retrieved 26 October 2012. ↑ "Philly Mayor Tells People in Flood-Prone Areas to Leave". NBC 10 Philadelphia. Retrieved 26 October 2012. ↑ Preston, Jennifer. "Tracking Hurricane Sandy Up the East Coast". New York Times. Retrieved 25 October 2012. ↑ "Gov. Cuomo Declares State Of Emergency As Hurricane Sandy Makes Its Way North". CBS News New York. Retrieved 26 October 2012. ↑ Kaplan, Thomas; Hernandez, Raymond (26 November 2012). "Cuomo Cites Broad Reach of Hurricane Sandy in Aid Appeal" – via NYTimes.com. ↑ "Governor Malloy to Partially Activate the State Emergency Operations Center at 8am Saturday". Hurricane Sandy News and Information. CT.gov. Retrieved 27 October 2012. ↑ "Gov. Malloy Signs Declaration of Emergency". Hurricane Sandy News and Information. CT.gov. Retrieved 27 October 2012. ↑ "Massachusetts will start to feel Sandy's fury late Sunday night; governor declares state of emergency". Boston Globe. Retrieved 27 October 2012. ↑ "Weather - Canadian Hurricane Information Statements". Weatheroffice.gc.ca. 2012-07-30. Retrieved 2012-10-27. ↑ Junker, Wes (2011-10-18). "Overnight models still indicate blockbuster storm threat from Hurricane Sandy - Capital Weather Gang". The Washington Post. Retrieved 2012-10-27. ↑ 49.0 49.1 49.2 49.3 49.4 49.5 "A look at Caribbean deaths and damage from Hurricane Sandy". The Washington Post. Associated Press. October 30, 2012. Retrieved 2012-10-31. ↑ "Factbox: Storm Sandy blamed for at least 132 deaths in U.S., Canada". Reuters. Reuters. November 16, 2012. Retrieved 2012-11-17. ↑ "Christie estimates Sandy damages at $29.4 billion". Philly.com. November 23, 2012. Retrieved 2012-11-23. ↑ 52.0 52.1 Watts, Jonathan (October 30, 2012). "Hurricane Sandy: Haiti in emergency aid plea as disaster piles upon disaster". The Guardian. Retrieved 2012-10-31. ↑ "Haiti storm death toll to 54; up to 71 for region". WAVY.com. Retrieved 2012-11-01. ↑ "Early U.S. state government figures estimate economic loss from Sandy at USD30 billion, according to Impact Forecasting catastrophe report". Aon Plc. Sacramento Bee. November 9, 2012. Retrieved 2012-11-10. ↑ "Haiti struggles to recover after Issac and Sandy". Irish Red Cross. ReliefWeb. November 13, 2012. Retrieved 2012-11-21. ↑ (Spanish) "Haïti : 44 décès en un mois, le choléra en hausse après Sandy". Agence France-Presse. ReliefWeb. November 20, 2012. Retrieved 2012-11-21. ↑ (Spanish) "'Sandy' deja daños por 2 mil 121 millones de pesos en Cuba". Notimex. El Universal. October 30, 2012. Retrieved 2012-10-30. ↑ "Beautiful Santiago de Cuba after Sandy". Martinez, Rosa. Havana Times. November 3, 2012. Retrieved 2012-11-04. ↑ "Haiti raises death toll from Hurricane Sandy to 54; regional deaths up to 71". Associated Press. Fox News. October 31, 2012. Retrieved 2012-10-31. ↑ 60.0 60.1 "Flying debris kills woman amid Toronto storm". CBC News. 2012-10-30. Retrieved 2012-10-29. ↑ "Sarnia, Ont., hydro worker dies repairing Sandy damage". CBC News. 2012-10-31. Retrieved 2012-10-31. ↑ "Preliminary estimates peg insured damages from "Superstorm" Sandy at $100 million". Yahoo!. ↑ "The Caribbean: Hurricane Sandy Situation Report No. 2 (as of 19 November 2012)" (PDF). United Nations Office for the Coordination of Humanitarian Affairs. ReliefWeb. November 19, 2012. Retrieved 2012-11-21. ↑ "Jamaica PM says Sandy damage at J$5 billion and climbing". Stabroek News. 1 November 2012. Retrieved 2012-11-01. ↑ "Sandy's death toll rises as Northeast begins recovery". USA Today. Retrieved 2012-11-01. ↑ "Sandy death toll in US rises to 109; 'there could be more,' Bloomberg warns". NBC News. Retrieved 2012-11-03. This page was last changed on 16 March 2019, at 09:27.